ASP.NET Forums/Data Access/ADO.NET, Entity Framework, LINQ to SQL, NHibernate/Duplicate Nested Using Blocks - A better way? Duplicate Nested Using Blocks - A better way? Re: Duplicate Nested Using Blocks - A better way? Create a generic method that can execute any SQL or procedure and return a generic result set. I need to start using Generics more. I read about it when it was first introduced but have since forgotten about it and never really learned it. 1 Sir, first of all, I am not good at Oracle, but I recommend this for you. it seems looks good and not EF. 2 and as far as I know, in c#, there is DataContext class, not EF. The purpose of the DataContext is to translate your requests for objects into SQL queries to be made against the database, and then to assemble objects out of the results. 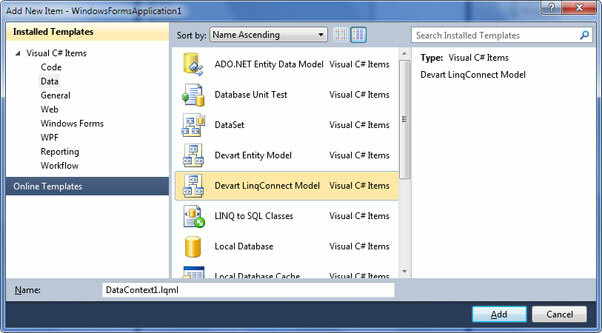 The DataContext enables Language-Integrated Query (LINQ) by implementing the same operator pattern as the Standard Query Operators, such as Where and Select. // DataContext takes a connection string. // Get a typed table to run queries. // Query for customers from London. This doesn't seem to be compatible with framework 4.5.2 but very cool idea.